Canada’s Sidney Crosby rejoices after scoring the winner in overtime as Canada beat the United States 3-2 in the gold medal hockey game at the 2010 Winter Olympics in Vancouver. Certainly the best Canadian goal in recent history. 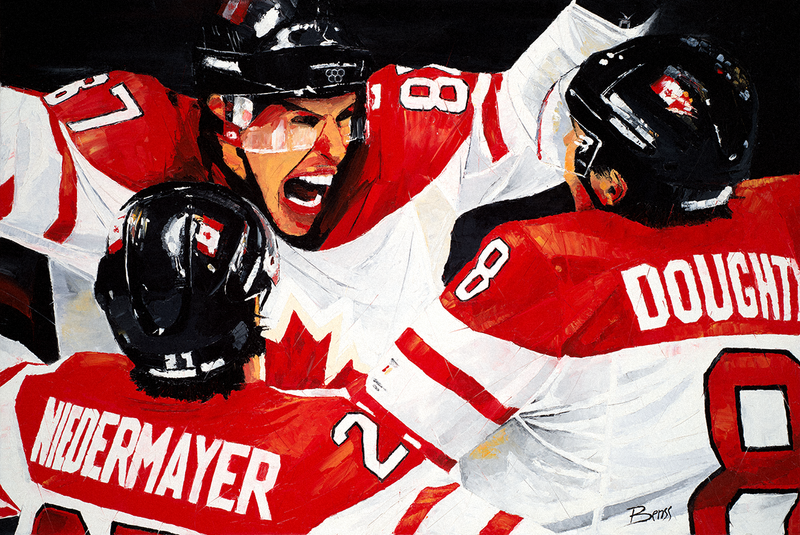 This painting was done exclusively for the Canada’s Sports Hall of Fame Fundraising Event. It raised an impressive 15,000$ at the 2012 Induction Celebrations. Added to that, another 3,500$ was raised with reproductions of “The Golden Goal” and “The Pose – Ken Dryden”. It was a real honor to be part of that major event.